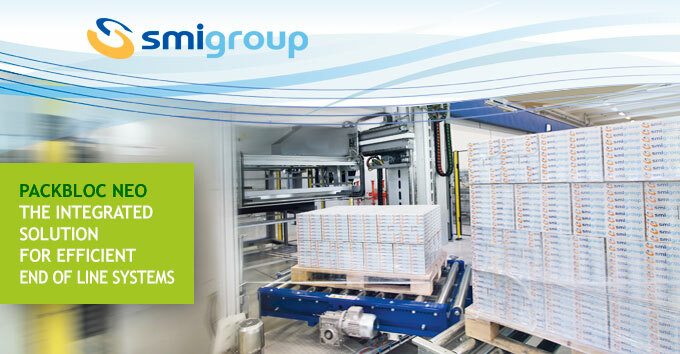 SMI offers compact cutting-edge solutions like the APS P series of automatic palletizing systems, integrating in the central column both the layer-loading head (basket) and a SCARA articulated arm which takes care of the operations of empty pallet feeding and interlayer pad insertion, thus forming a "3 in 1" compact unit. management of the entire system by a single operator. 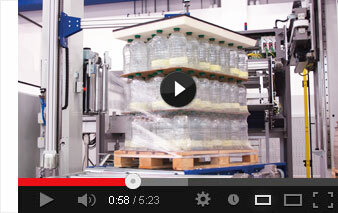 The heart of the compact and integrated Packbloc Neo system is the Smipal APS P palletizer. The fixed central column houses the layer-loading head equipped with telescopic guides and an articulated arm based on SCARA technology. All the vertical and horizontal movements of the mechanical components of this SMI palletizing system are managed by the machine's automation and control system, which, thanks to electronically-driven brushless motors, ensures precise and coordinated trajectories for each one. The compactness and efficiency of the Packbloc Neo solution are further enhanced by the integration into the palletizer's frame of an "Easy Round" turnplate pallet wrapper, which wraps the individual layers as soon as they are placed on the pallet. This solution is especially suited to the palletizing of unstable containers such as, for example, loose 5 to 10-liter bottles not packaged in cardboard trays and which remain firmly placed on the pallet, as it advances on the machine's conveyor belts, thanks to the wrapping of the single layer. For further information about SMI end-of-line solutions, we invite you to contact our sales department or to visit our website www.smigroup.it. Thank you for your kind attention. Warmest regards.